Cats transmit the disease to humans when they bite or scratch a person, causing a break in the skin. There is no evidence to suggest that fleas can transmit the disease directly to humans through a flea bite. Bacteria are also found on the coat of infected cats and can be transmitted to a person with open wounds on their skin by just stroking or holding an infected cat. Bacteria enter the wound of the affected human and causes local inflammation with swelling and redness of the area. A vesicle or an erythematous papule (a small blister almost like a pimple) may form at the site of initial infection during the progression of the infection. Soon after the initial bite or scratch, people develop signs of fever, headaches, decreased appetite, nausea, muscle pain, chills and joint pain. There is a swelling of the lymph glands closest to the area where the initial bite occurred. This is also known as a regional lymphadenopathy. The lymph glands become enlarged and painful and the nodes glands most commonly affected are in the armpit, the groin and the junction between the neck and jaw. The best way to avoid this disease is to avoid situations where you can be bitten by a cat. Kittens are often playful and rough play frequently results in scratches or even bites. When bitten or scratched, it is important to wash the wound thoroughly under running water and cleaning it with a disinfectant. Never let cats lick open wounds on your skin. Since the disease is transmitted to cats by fleas, good tick and flea control is very important in your cat. It is important to take note that you should treat all your animals (dogs, cats and any other animals you may have) for fleas, even if you find just one flea on only one animal in your household. It is often difficult to see fleas on your cat because by grooming themselves they actually often catch and shallow fleas during the process. It is advised that people with weakened immune systems adopt cats that are older than one year of age, since kittens are the most likely carriers of the disease. 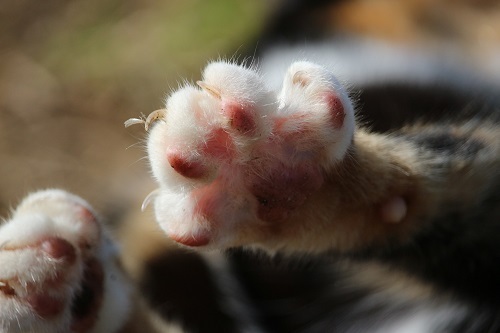 Keeping your cat’s nails trimmed can also help prevent infection. If you experience any of the above named symptoms after being bitten or scratched by your cat, it is strongly advised that you see your doctor.